I read The Conservationist in a kind of appalled fascination, repelled by the language South African Whites use to talk to and about the Blacks in the book. Nadine Gordimer, the Nobel Prize winning author of this Booker Prize winning story, depicts her characters routinely using the language of master and servant in the most disparaging way, a kind of amused contempt exacerbated by its casual delivery. Reading it, one feels besmirched simply by being privy to the perspective of its White anti-hero, Mehring. He’s been abandoned by his wife who’s gone to America, and although he’s had custody of his son, now that the boy’s grown up they don’t get on, and Terry is about to leave South Africa to join his mother. Mehring feels alienated not just because of Terry’s 70s long hair but also because the boy has disconcerting ideas about the need for change in South Africa. He doesn’t just want to avoid compulsory military service for the obvious reasons but – frustrated by the way things are – he doesn’t want to defend the country the way it is. His father simply doesn’t understand that at all. Mehring had a Leftie mistress too, but their relationship is fractured because she wants change. He can’t see the need for it and wants to avoid any intimations of it by escaping to his weekender farm outside Johannesburg. She’s given up on him and their interactions are characteristed by her scornful hostility to his money and his complacency. So Mehring is a symbol of South Africa under sanctions, increasingly isolated in a world community which deplores Apartheid. Mehring, as is obvious from the everyday racism which underlies all his relationships, sees nothing wrong with the way things are. He’s not a wicked man in the sense that he engages in direct violence; he’s more insidious than that. He thinks that white supremacy is the natural order of things, and that Black/White relations as they are reflect the natural superiority of people such as himself. He is complacent and insular and wants to conserve the political status quo just as much as he wants to conserve the birdlife on his farm. Gordimer is a master of voice, and she depicts these relationships through Mehring’s thoughts and dialogues to show with shocking clarity just how appalling the attitudes of White South Africans were. His assumptions about the abilities of other races are patronising and insulting, and his easy acceptance of the gulf between their lives and aspirations and his own are galling. He notes, without embarrassment, that his workers don’t eat much meat because they can’t afford it. They have it once every six weeks or so at best. (This is for men doing hard physical farm labour). So at Christmas time, considering himself a generous employer, he not only obtains a job lot of cheap clothing as gifts for the men, he also gives them a slab of meat. That night he is disturbed by the dog howling in pain, and as the noise goes on and on he notes with irritation that they are beating it to within an inch of its life. It doesn’t take him long to work out that they are doing it because – obviously since they don’t have anywhere secure to store the meat – the dog has stolen it. He doesn’t intervene to rescue the dog, and it doesn’t occur to this millionaire to replace the meat. He thinks that his workers are happy and contented. It doesn’t occur to him to ask where the children of his female guest workers are or who might be looking after them, and is peeved when the women – being paid a pitiful daily rate – don’t start work ‘on time’. He is repelled by the filthy rotten teeth of workers for whom dental or medical care is a fantasy. So there he is on his farm, enjoying the beauty of it, savouring the satisfaction of seeing things grow, and congratulating himself for outsmarting the weather and the occasional bushfire with good husbandry. He’s free from the need to make any changes in his life because he’s rich. He can patronise Jacobus, his farm manager who does all the work; and he can boss around almost everyone he comes across because even though he’s not really very bright, he is, by virtue of his skin colour, successful and powerful. However, I have to confess to becoming weary of the fractured style at times. Mehring’s thoughts, memories and conversations weave in and out of the text without clear demarcations, and sometimes it was rather confusing, working out just exactly who he was talking with, or if he was actually having a conversation at all. I’m sure I missed things here and there, as you do with impressionist writing but for me, it did work most of the time and I found it rewarding reading. 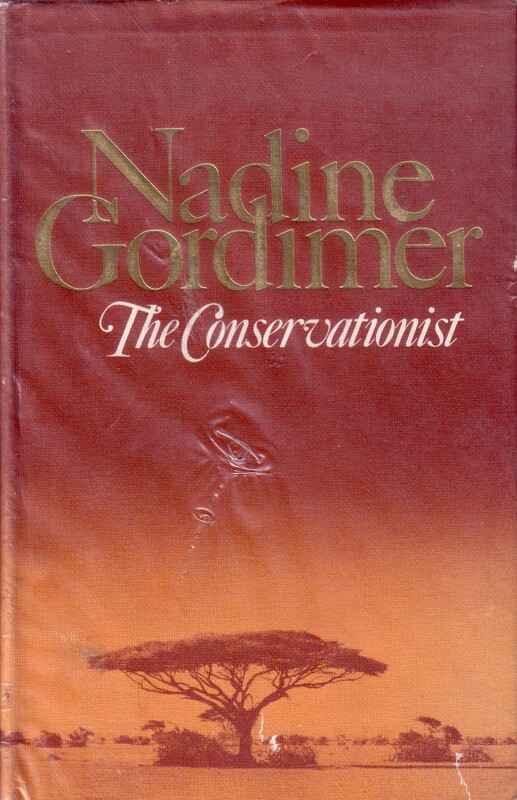 Nadine Gordimer was awarded the Nobel Prize for Literature in 1991, and was joint winner of the Booker Prize for this novel in 1974. I plan to read Stanley Middleton’s Holiday this year too, so it will be very interesting to see why it was that the judges could not separate the two! Source: Personal Library, purchased from Rozabooks in South Africa via AbeBooks. Great review, Lisa. I discovered Gordimer last year and read a couple of her books — July’s People and The Pickup. I really enjoyed both of them. Initially I found the way she constructed her sentences quite odd but once I got into the rhythm of her prose style I was smitten by both books. I hope to read more of her work in the year ahead. The Conservationist sounds a good a place to start as any. The only other one I’ve read is The House Gun, but I’d like to get to July’s People one day. I feel the same as you do whenever I read South African Lit and I have been reading it for some time. However, if one comes to appreciate the environment within which it was written one would realise that we need not feel bad because the author has described it so but because certain individuals did these against another group of people. It is like the call to sanitise Mark Twain’s Adventures of Huckleberry Fin. There once was a time when blacks were servants and whites the masters. Hence, it isn’t contempt of the black race by the author but the contempt of the black race by a government that was anti-black. Hello Nana, and welcome to ANZ LitLovers – thank you for taking the time to comment. I agree with you absolutely, Gordimer was reproducing the way that white people thought and spoke in order to mock them, not because she felt contempt for the black race. She was a brave woman who was an activist for change for many years and is a real hero of the anti-apartheid movement. Yes, I agree, it took remarkable courage to belong to the ANC in the days when it was banned. And through her books she was a voice speaking out on the international stage against Apartheid and bringing the issue to people who would otherwise have known nothing about it.